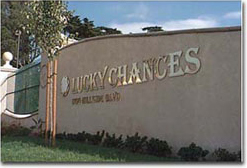 Lucky Chances opened its doors to the public June 28, 1998. The newest Card Club in the Bay Area, Lucky Chances has the latest, most sophisticated equipment and facilities to serve you. Unlike any other casino, Lucky Chances Casino never falls short of what the player needs. Enter the doors of Lucky Chances and find out what makes us the most sought for casino in Northern California. A friendly atmosphere and comfort just like your own home. Just click on any link to find out how Lucky Chances best serves you!